F.O.X.Y. Women & Wine WEST!!! 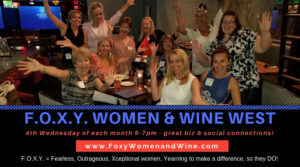 Join dynamic women in the west valley to network and be social! F.O.X.Y. stands for the type of women we attract! They are; Fearless, Outrageous, X-ceptional women, who Yearn to make a difference – and DO! They are the BEST of the BEST in their industries and communities! This month we are being hosted by spa810 Arrowhead! We LOVE visiting spa810! They take GREAT care of us and are graciously providing 1 complimentary glass of wine and light appetizers as we mingle and network! Also, take a tour of their gorgeous spa while we are there! Get your tickets here online today!